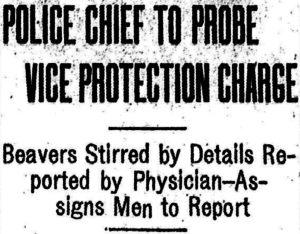 Following the charges of a prominent Atlanta physician regarding vice conditions and alleged police protection in this city, Chief of Police Beavers despatched an officer to confer with this physician Thursday morning. The officer will endeavor to obtain even more information than has been furnished the chief and will try to substantiate that already given. He will pay especial attention to the statement of the physician that he reported a disorderly house to the police and that the proprietors of it were “tipped off” by some officer. Chief Beavers is concerned over this phase of the question. He admits that there must be something in the charges, as the source of his information is reputable. The alleged disorderly houses reported to the chief are being watched closely, but he said that no evidence against them had been obtained yet. Sergeant L.S. Dobbs, who has been investigating the locker clubs to see if they had any members of the police departmet [sic] enrolled, has finished his work and reported to the chief that he was unable to find any police members. He said that there are a number of local fraternal organizations with police members, and that these orders have locker club attachments, but that so far as he could learn no policemen were in the habit of using them. Chief Beavers declared that there was nothing wrong with an officer belonging to a fraternal order, provided he did not use his membership for anything other than fraternal purposes. Chief of Detectives Lanford declared Thursday morning that he had taken steps to investigate the charges made by the physician that several of his men had been seen drinking in two downtown locker clubs.